A cycling time trial is sometimes called the 'race of truth' because it is the simplest purest race against the clock. Each rider sets off on their own and covers the specified course in the fastest time they can, alone and unpaced. It is you against the clock. No tactics, no teamwork, no game-plan other than to finish in the shortest possible time. Riders usually set off at minute intervals, counted down by the timekeeper. You ride at your own pace and may be overtaken by other riders, or you may overtake others. Whatever happens you must never shelter in the slipstream of another rider and you should not take pace from anyone else (as your result will be disqualified). The beauty of time trialling is that anyone can do it. Fast or slow, young or old, experienced or inexperienced. If you want to spend thousands of pounds on a state-of-the-art bike you can, if you want to ride on the old bike you've got in the shed you can - as long as it is roadworthy. 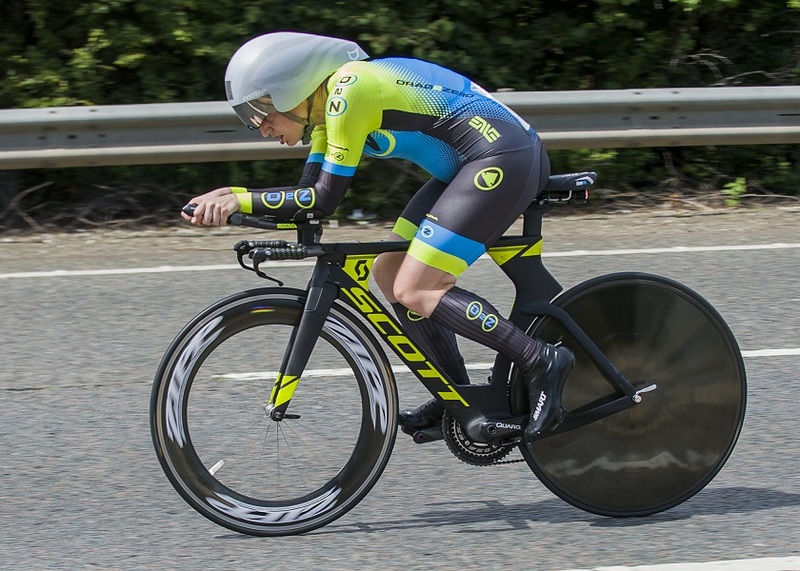 There are two types of events in British time trialling – Club Events and Open Events. The VTTA organised events are normally Open events but many riders make a start in the sport by riding local Club events. These events are run by local cycling clubs primarily for the benefit of their own club members. Events usually take place on weekday evenings during the summer and often clubs hold events every week with a points competitions or league over the whole season. Although club events are mainly for club members it is a tradition in time trialling that visiting riders are made welcome. So if you would like to take part in a race and you can find the details of a local club event taking place near by then you would be welcome to go along and ask the event organisers whether you may take part. No pre-entry is required but there will be a small charge of £3-£5. Go along to the meeting point in plenty of time for the start of the race, sign-on, pay the entry fee and join in. These events are more formal with pre-defined start lists (no entries are ever accepted on the day). Clubs put on open events, usually at the weekend, for the benefit of the wider cycling community. Anyone who is a member of a CTT-affiliated club is eligible to enter an open event but the entry closing date is usually two weeks before the event so some forward planning is needed. Riders receive a start sheet from the event organiser by email or post during the week before the event. This will give full details of the event HQ and your start time. For safety reasons and for the standardisation of distances time trialling is only done on roads which have been approved for use by the local CTT district committee. Factors which are taken into account in the risk assessment include the safety of the start and finish points, the volume of traffic, the width and surface of the road and the safety of junctions. Obviously courses need to be free of traffic lights or junctions where stopping is likely to be a necessity. They are often of a standard distance such as 10, 25 or 50 miles, but this is not always the case. In time trialling each approved course is represented by a course code. Unfortunately this can mean that those who do a lot of time trialling often talk in course codes which can seem a bit bewildering - but it is just easy short-hand for those who are heavily into their time trialling! Club events require no pre-entry. Just turn up on the day of the event in plenty of time, sign on and join in. Online - to enter an event online you must go to the National CTT website, find the event you want to ride under the list of events and use the online event entry system. You will need to register on the system, enter all your details and pay with a credit or debit card. By Post - alternatively you can complete a hard copy entry form and send it to the event organiser with a cheque made payable to the organiser. You will need to get the organiser's details from the National CTT website or from the CTT Handbook which you can purchase online through the National CTT website. An entry form can be found here. Time trials in Scotland are also organised by Scottish Cycling. See here for details.